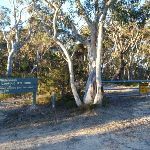 From the car park, the walk passes around a gate and follows the management trail. 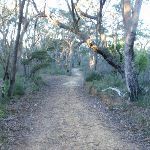 The management trail winds through the bush for some time before arriving at a large clearing with a fence and warning/danger sign. 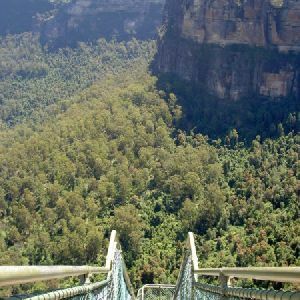 There is a great view from this point. Continue straight: From the clearing, the walk heads up past the ‘Warning’ sign to wind around a metal fence. 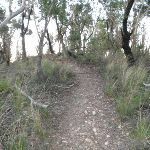 The track passes a rocky knoll and then comes down to a small clearing where it turns left to follow the clifftop down the hill for approximately 80m. 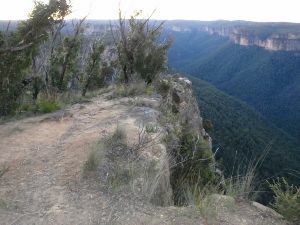 The track comes to Baltzer Lookout on the cliff edge. 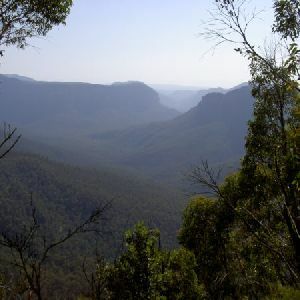 Baltzer Lookout, Blue Mountains NP, is the best place for viewing and accessing Hanging Rock. 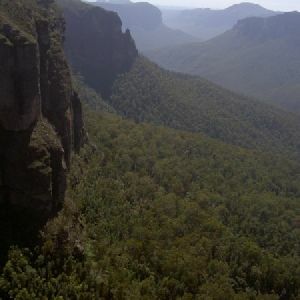 It also offers spectacular views over the Grose Valley. 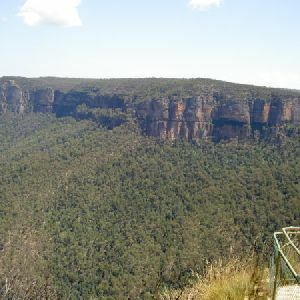 The lookout is named after W.J. 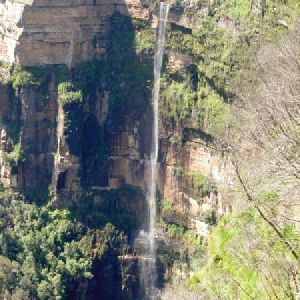 Baltzer, who was part of a group created by Myles J Dunphy to recommended that the Grose Valley become a wildlife sanctuary, in 1933. 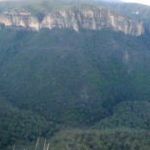 The Grose Valley and much of the surrounding area is now protected. More info. 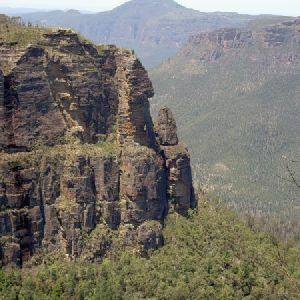 Hanging Rock, Blue Mountains NP, sits high on the southern side of Grose Valley. 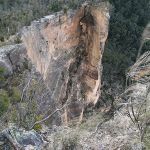 It is a spectacular example of ‘geological time is now’, with this large spire of sandstone precariously hanging out from the cliff. 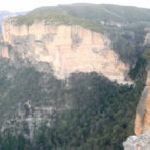 The cliff is popular with rock climbers and other recreationists, while walkers can best view Hanging Rock from Baltzer Lookout. 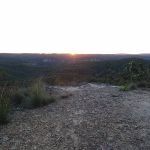 Around 3.5km of this walk has short steep hills, whilst the remaining 240m is very steep. 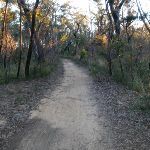 Around 3.5km of this walk follows a formed track, with some branches and other obstacles, whilst the remaining 240m follows a rough track, where fallen trees and other obstacles are likely. 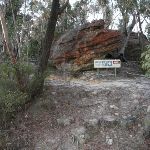 Around 3.5km of this walk has directional signs at most intersection, whilst the remaining 240m has minimal directional signs. 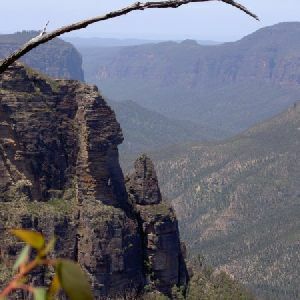 Around 3.5km of this walk requires no previous bushwalking experience, whilst the remaining 240m requires some bushwalking experience. 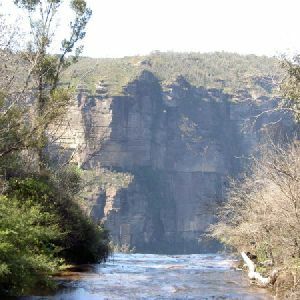 Around 3.5km of this walk has limited facilities (such as not all cliffs fenced), whilst the remaining 240m has limited facilities (such as cliffs not fenced, significant creeks not bridged). 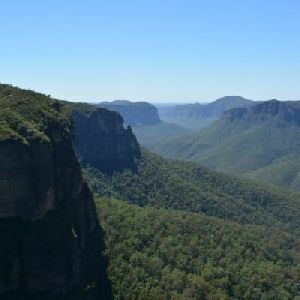 A list of walks that share part of the track with the Baltzer Lookout, Hanging Rock walk. 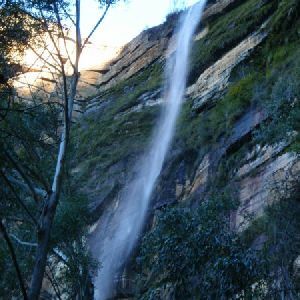 A list of walks that start near the Baltzer Lookout, Hanging Rock walk. 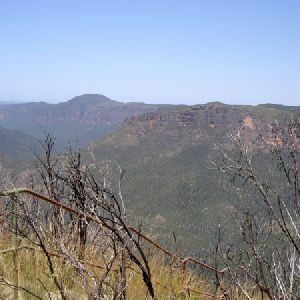 http://new.wildwalks.com/wildwalks_custom/includes/walk_fire_danger.php?walkid=nsw-bmnp-blhr Each park may have its own fire ban, this rating is only valid for today and is based on information from the RFS Please check the RFS Website for more information.